Bayly's War is the compelling story of the Royal Navy’s Coast of Ireland Command (later named Western Approaches Command) during World War One. As an island dependent on imports for both food and manufacturing, Britain was extremely vulnerable to the disruption of its supply chain in times of war. Nowhere was this more true than on the nation's Atlantic coast. Food and munitions (and later soldiers) from North America, men and goods from Canada and the Caribbean, ores and raw materials from the Southern Americas – all passed through the "Western Approaches", the tract of the Atlantic Ocean to the west and south of Ireland, on their way to Liverpool or the Channel ports and London. Here was to be fought the greatest sea battle of the war – the fight for survival, as Germany's U-Boats targeted trade in the Atlantic in an attempt to drive Britain to submission through lack of food and materiel. Based in Queenstown, Ireland, Britain's naval forces fought a long and hard battle to protect trade and keep the seaways safe for traffic. They were not always successful and only when joined by American naval forces in 1917 did the Allies begin to fully master control of the sea in these vital waters. The book tells the exciting story of this "war within a war". From its early days as a sleepy backwater of little importance and less resources, by the end of 1915 the Command had become one of the most important of the war. The sinking of the Lusitania in May of that year triggered a wave of revulsion which led to a new commander-in-chief being appointed to the Coast of Ireland Command, Vice-Admiral Sir Lewis Bayly. A fierce disciplinarian with a mania for efficiency, in semi-disgrace before being plunged into the undersea war and thought by some of his colleagues to be more than a little mad, Bayly nonetheless took the fight to the enemy. Utilising any vessel he could find - trawlers, tugs, yachts - he set out to hunt U-Boats. Under his aegis, Q-ships were perfected and their brave crews sailed the Atlantic hoping to attract unsuspecting submarines to their doom. Bayly fought for, and gained some extra resources in the form of newly commissioned sloops and with these he introduced U-Boat hunting patrols. The command swept for mines, escorted merchantmen and fought against the capricious Atlantic weather as well as the Germans but was always hampered by a lack of suitable vessels. Bayly drove his crews and ships to the extremes of their capabilities but gained their respect for his wholehearted dedication to the cause and unstinting concern for his men. When America joined the war, and sent destroyers to Queenstown to serve under him, Bayly – to the surprise of many – gained their respect too and integrated the command into one homogenous fighting force. Along the way, the Command had to deal with the ambivalent attitude of the Irish population, the 1916 Easter Rising, the attempt to land arms on Ireland's west coast and the resurgence of Irish nationalism in 1917. Q-ship actions, merchant ship sinkings and rescues, U-boats hunted down and caught or lost, valiant men and stubborn ships, seven Victoria Crosses won, America's first submarine kill, all are vividly detailed in Bayly's War, a fight to the death in the cold Atlantic waters. ‘This new book gives a comprehensive coverage to the subject of the WWI anti-submarine warfare with fresh insight – Strongly Recommended’. ‘This is a fascinating narrative of a vital but too much neglected aspect of our fight for national survival - well researched, well ordered and well presented, with an interesting collection of contemporary photographs’. ‘Steve Dunn's super story of Vice Admiral Sir Lewis Bayly reads like the script for one of those brilliant picture stories we used to get in Wizard and Hotspur. I had never heard of the man until now, and I am pleased to have had the opportunity to get to know him in the pages of Steve's brilliant book’. ‘This is a first class addition to the corpus of naval history relating to the First World War, to which Dunn has already made several excellent contributions’. 'This book is well-written and researched, and may well become a standard reference work on its subject'. 'An easy-to-read, fascinating account of sacrifice and bravery, shedding new light on the remarkable Bayly'. ‘A concise but well-researched and eminently readable account……It provides an excellent introduction to a largely forgotten campaign’. ‘A well and very excitingly written description of the intense and vital activity of the Royal and, later, United States navies in the Western Approaches to England during World War I, this important book reminds us of an important but mostly forgotten aspect of naval history’. ‘Dunn’s work is a fine piece of historical writing’. 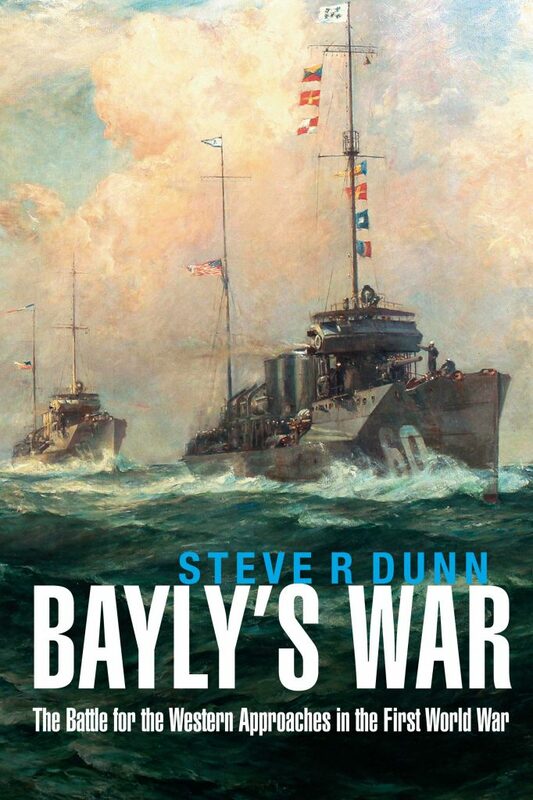 'Bayly's War is unreservedly recommended for the personal reading lists of military history buffs, as well as both community and academic library World War I Military & Naval History collections and supplemental studies reading lists'. ‘Dunn’s book provides readers with a succinct and effective description of the war off of the Irish coast’. ‘Bayly's command played a vital role in keeping the Atlantic sea routes open, and showed that a joint command could prove decisive. The author is to be congratulated on his book which recounts the wartime success of a man who arguably deserves greater recognition. Highly recommended’. ‘I highly recommend Bayly’s War on many levels. It brilliantly addresses an aspect of the First World War that has received little coverage; namely, the demanding struggle to keep a critical supply line open, and introduces the reader to a fascinating British Admiral who has largely been forgotten with the passage of time’.